Episode 50 - Sanjay returns to Hastinapur with messages and intelligence from the Pandava camp. The king's charioteer delivers this information before the royal assembly, while Dhrarastra, Duryodhana, Bhisma and Karna argue over the significance of these threats. Having gone a good long while since Karna last washed his feet, the mess must have started getting to him, because he finally blows his top at Bhisma and swears he will not fight until Bhisma is dead. In the course of this debate, we get hints at some other tales that we are yet to hear about. One of these involves Bhisma and Sikhandin. We only get a few tantalizing hints at their back story, but we are told that this warrior is destined to kill Bhisma. Rest assured that Bhisma will tell the full story a little later in the current book. The other unfinished tale involves Karna's enrollment as Parashurama's student. Again, we only get a brief summary, but we hear that Karna had lied to the old Brahmin about his birth, saying he was a fellow Brahmin in order to learn the secrets of the Brahma-head missile. When Parashurama discovered Karna's deception, he cursed him, saying that the weapon would fail him when he needed it the most. I'm not sure when we will get the full version of this tale, because it does not show up in the Book of the Effort, and I do not have an index for the books to follow. It's a good story, so I hope we get to it soon! Karna is kind of a pitiable figure. While Arjun is getting magical weapons by the cartload heaped on him lovingly by the best of the Gods, poor Karna is forced to sacrifice his natural-born armor for a single measly arrow from Indra, and must compromise his reputation and sacrifice his spiritual tapas in order to get the Brahma-head missile. 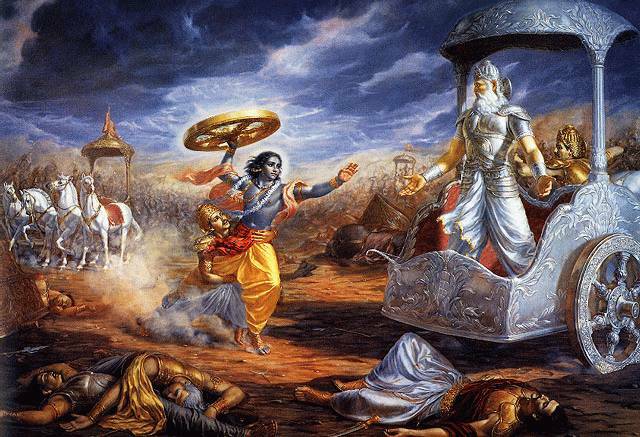 Despite the sacrifices, both weapons are fatally flawed, since Indra's weapon cannot be used against the Pandavas, and the Brahma-head has been cursed to fail in its objective. Poor Karna-- he never seems to be able to catch a break! Finally, in a more private setting, Sanjay reveals that he has converted to a new religion! Krishna and Arjun are beginning shed their human aspects and increasingly appear as divine beings. The charioteer was quick to notice the transformation, and he appears to be an early adopter of the new cult of Krishna-worship. With Vyasa present to endorse his newfound religious zeal, Sanjay presents the king with the first tenet of Bhakti worship. Duryodhana remains obstinate, but the king & queen both become converts. So here is a website that's got more names than I knew the translations of in Sanskrit. My knowledge of Sanskrit mostly comes from yoga, which is funny because so many of the names of the poses come from the names of the characters and stories from the Mahabharata. For example: the first time I read the name Karna, I wondered why he'd be named ear (which I knew from Karna Pidasana- ear pain pose), until I realized that his earrings were his gift and downfall. I love the depth the story can gain from the names basically meaning the most important thing you should know about the characters. The wait between episode releases is killing me!